​Unconvinced about the business benefits of diversity and inclusivity (D&I)? Having trouble persuading others to engage with these issues? With help from the Intellectual Property Office’s fabulous design team, we’ve created a poster (below) to illustrate the many business benefits of improved D&I. We hope you can make use of it in your own organisation, to raise awareness, start conversations and bring even the most sceptical of your colleagues on board. ​The poster takes the form of a tube map, with each business benefit shown as a “station”, along “train lines” representing individual business functions. These lead, ultimately, to better business outcomes: greater profitability, reduced risk and greater productivity and efficiency. What the map is intended to show is how all the benefits inter-connect throughout an organisation, each impacting on several aspects of its activities and outputs. The organisation’s internal processes, shown as a kind of “Circle Line” at the heart of the network, cross-link with the other lines to amplify their effects. So improving your diversity and inclusivity can bring improved organisational performance on several levels. 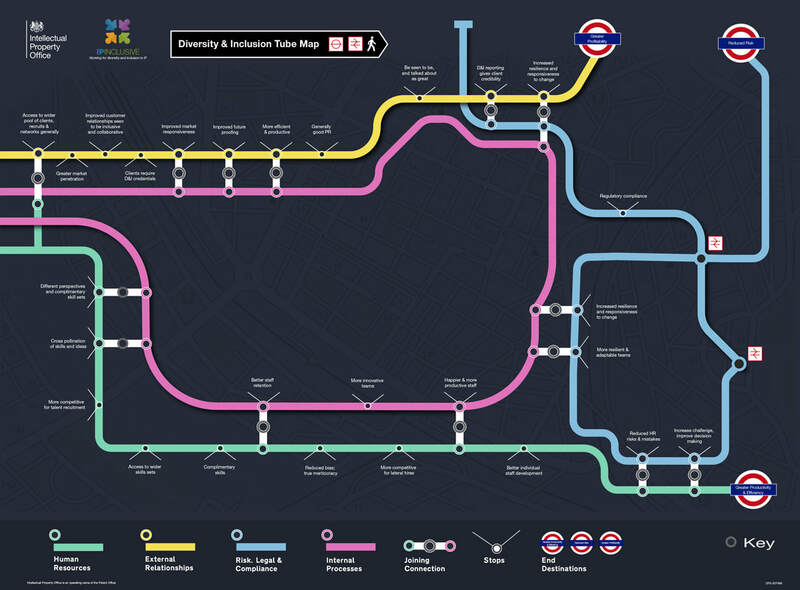 Whether you get on-board through the benefits of better staff retention, improved market responsiveness or more astute decision-making, the D&I tube map can help you to plan your journey to arrive at better business outcomes. You can download the poster as a PDF here. Please print it out and display it somewhere prominent in your offices. This resource complements the presentation we prepared following our November 2017 workshop on the same subject, which you can download from our resources page. And in case you missed our joint IP Inclusive/CIPA webinar about it on 5 July, here’s a link to the recording.